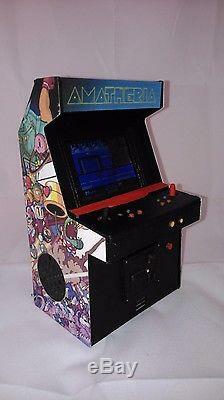 Searching through many handmade arcade machines, I realised that there are no 1/12 working ones. There are many of them in miniature, but made entirely for the user, not regarding the miniature itself. I wanted to make an arcade machine with proper scale, with proper buttons and joystick. The machine is in 1/12 scale, perfect for dollhouses and 13-16cm figures (Figma, Revoltech, etc). You can see it working in my Youtube channel: youtube. Measures are 145 x 85 x 75mm. 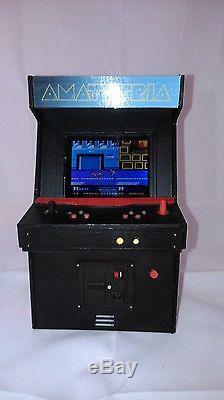 There are many games inside: Mappy, Double Dragon, Super Mario Bros, Galaga, Pac Man and many other ones. Please send me a message if you have any question. 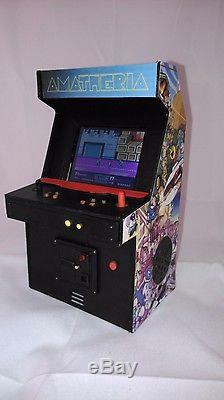 The item "Dollhouse miniature real working arcade machine, 1/12 scale" is in sale since Sunday, September 06, 2015. This item is in the category "Dolls & Bears\Dollhouse Miniatures\Furniture & Room Items". The seller is "amatheria" and is located in Sevilla. This item can be shipped worldwide.